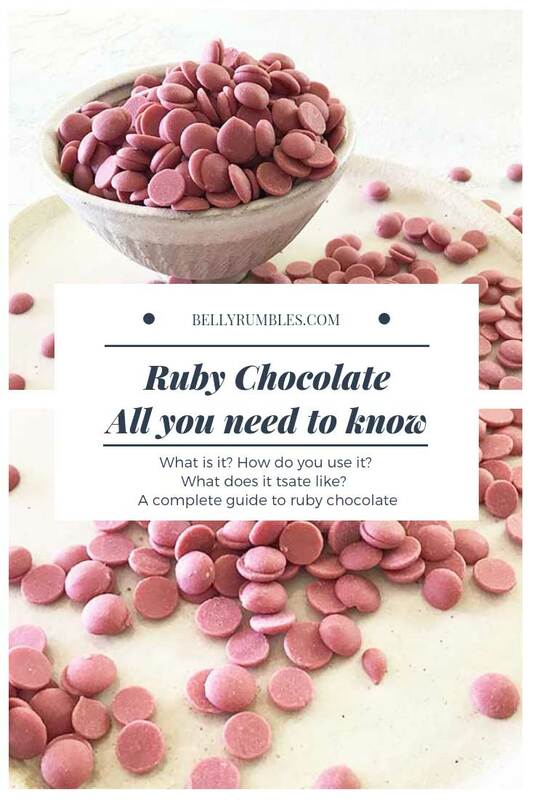 We look at what exactly is ruby chocolate, how to use Ruby Chocolate and most importantly, what does Ruby Chocolate taste like? 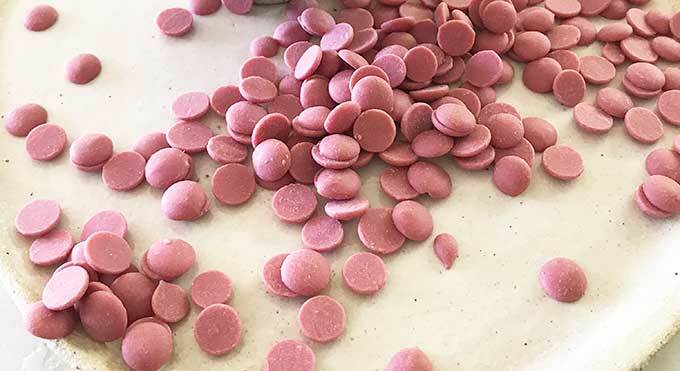 Ruby chocolate, also known as ruby RBI, is the newest chocolate discovery in 80 years. It is the fourth chocolate type after white, milk and dark chocolate. 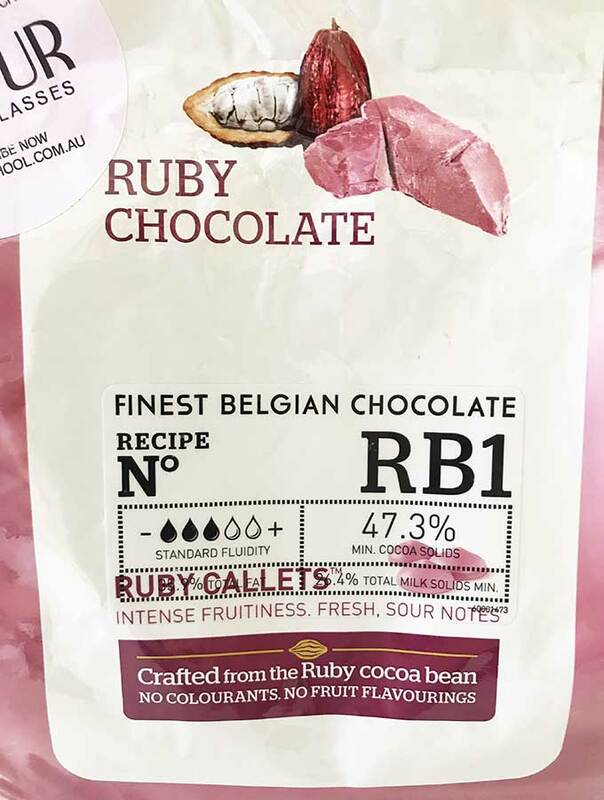 Ruby Chocolate was introduced to us by Barry Callebaut in 2017 and available to purchase from January this year (2018). Australia was one of the first countries for the roll out of the new chocolate variety, hitting our shores in September this year. 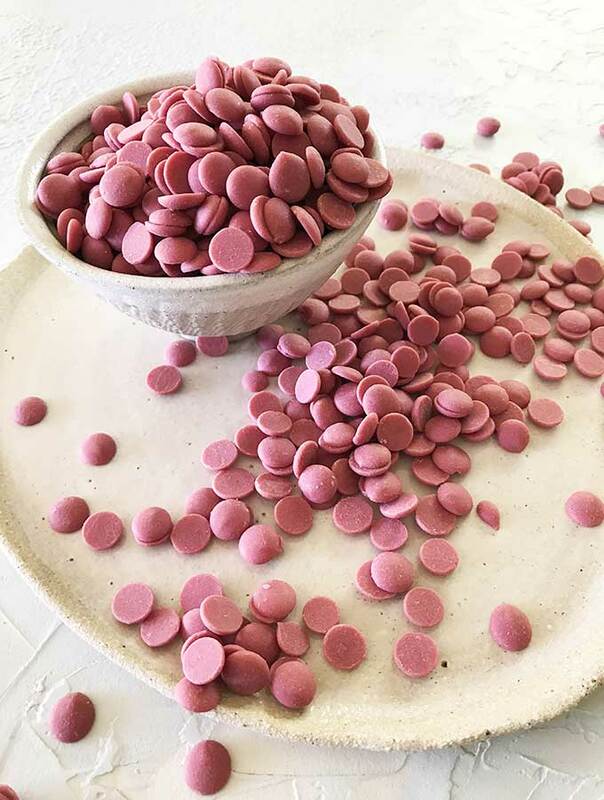 When Callebaut introduced ruby chocolate last September 2017, at a private event in Shanghai, confusion ran supreme. It simply looked like white chocolate with pink colouring. How Callebaut make ruby chocolate is a trade secret. Genetic modification has been mentioned and denied by Barry Callebaut. There has been speculation in the industry that unfermented cocoa beans are used to make ruby chocolate. Unfermented cocoa beans can have a natural red/pink colour. 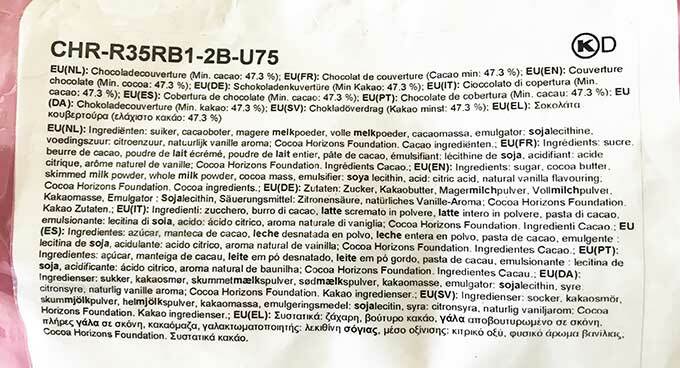 Callebaut registered a patent in 2009. The patent is for “cocoa-derived material” from unfermented cocoa beans (or beans fermented for no more than three days) that become red or purple after treating them with an acid and then defatting with petroleum ether. “The beans are like mother nature gave them to us and are not GMO. Barry Callebaut is able to identify the ruby beans containing the right set of attributes. Secondly, we developed a unique processing that makes those special precursors come alive, creating ruby chocolate,” Barry Callebaut. It seems it is all about the process and not necessarily the discovery of a new cocoa bean? Sugar, cocoa butter, skimmed milk powder, whole milk powder, cocoa mass, emulsifier (soya lecithin0, acid (citric acid), natural vanilla flavouring (Cocoa Horizons Foundation). Taste is a very personal thing, so let’s start with what I think ruby chocolate tastes like. It tastes very fruity, with berry qualities to it. There are sour notes, and it is these that make me think of a mildly tart berry flavour. It is sweet, like I find white chocolate is sweet. It also has a creamy texture when eaten. 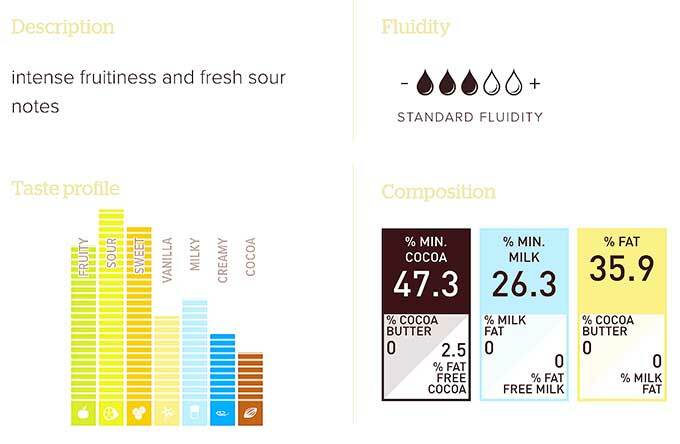 What does Callebaut say; “intense fruitiness and fresh, sour notes”. Callebaut state that there isn’t any fruit flavouring added to the chocolate, and that the flavour is all natural due to the beans. But it is interesting to note that vanilla flavouring is added. Does it taste like other chocolate? Yes and no. It reminds me of a fruit flavoured and coloured white chocolate. It doesn’t have a “pure” chocolate taste. I have read that the “chocolate” taste of chocolate develops during fermentation. This could be another indication they are using unfermented cocoa beans. If you are craving a traditional chocolate hit, I doubt it will do this for you. Especially if you are a fan of dark chocolate like I am. Ruby chocolate can be used the same way that white, milk or dark chocolate is used. It does temper at a lower temperature, it should be tempered between 28.5 – 29.5°C (83.3 – 84.2°F). You could use it to make mousse, cakes, ganache, cookies, it is totally up to your imagination. It of course can also be used to make truffles and chocolates. Callebaut have some wonderful chef tutorials on their website. This includes tempering and you can find them here. What Flavours Pair well with Ruby Chocolate? Pepper, curry, cinnamon, vanilla, ginger bread, mint, wasabi, basil, saffron, rosemary, passion fruit, lychee, apricot, pineapple, coconut, citrus fruit, red fruits, mango, algae, rose champagne, fruity beer, Gueuze beer, honey, cuberdon, caramel, almonds, hazelnuts, sesame oil, camembert, roquefort, green tea, sake, coffee, vinegars, dark chocolate, gold chocolate, velvet chocolate and scallops (St Jacques shells). How to store Ruby Chocolate? Store ruby chocolate in an opaque airtight container in a dark cool area. It is sensitive to light, air and humidity (as is other chocolate). If not stored correctly it can discolour taking on a greyish appearance. Do not store in the fridge. Where to buy Ruby Chocolate? In Australia you can purchase ruby chocolate from Savour Chocolate & Patisserie School and The Essential Ingredient. It is as sad fact that it does not retain its pretty rosey pink colour when used in cooking. The colour will change when added to liquids and turn a greyish pink. This will happen anywhere ruby chocolate isn’t being used stand alone and in its pure form. To overcome this, chefs may add beetroot powder or other pink colour to keep the pink colour of the chocolate. The colour of the chocolate may also be affected by sunlight, the colour will fade. 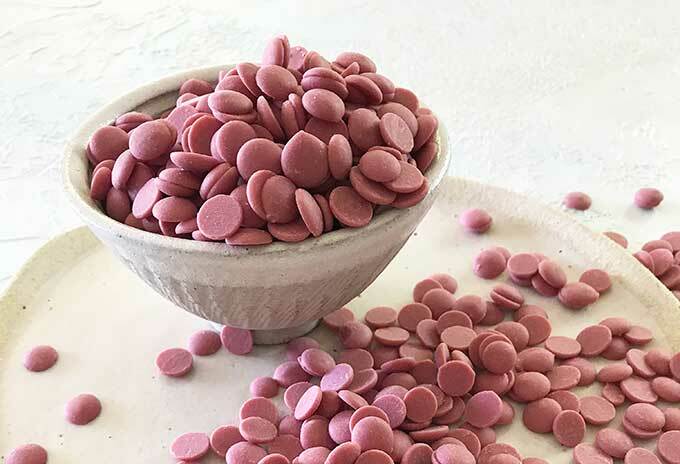 Have you tried ruby chocolate yet? If you have do let me know what you think. Hi Sara, thank you for the in-depth introduction on Ruby. As a homebaker, I’d like to introduce this new chocolate to my clients, especially for the upcoming mother’s day. I live in tropics, hot and humid year round and I saw your comments on not to store Ruby in the fridge and that instantly stopped me from using it. Is there any other way to overcome this problem? Am storing all my chocolates, including white chocolate, couverture and compound too without any problem. Also, can Ruby be used as a ganache to cover cakes? I’d be grateful if you could enlighten me. Thank you very much. It is recommended to not store any chocolate in the fridge. But, under your circumstances the fridge is the more stable environment for it along with your other chocolate. Yes you can use ruby chocolate as a ganache to cover cakes. Use it as you would any other chocolate. 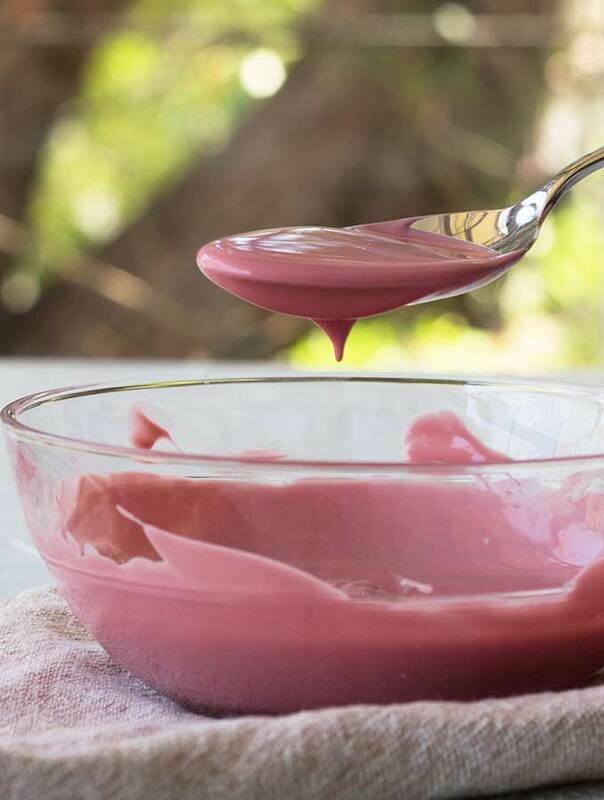 You will need to play around with the ratio of cream to ruby chocolate to get the right consistency you want for the ganache. Thank you very much for your prompt reply, Sara! Hope I can get my hands on the Ruby chocolate soon. Also, I really appreciate your honesty when you mentioned about the colour of the baked cake, it’s really helpful and I like people being honest. Keep baking and inspiring others. Have a great day there…. Never heard of this type of chocolate! Looks interestingly delicious! Thanks for sharing! This chocolate sounds amazing! I never tried anything like this! Great information. Thanks for sharing. Keep uploading content like this. Appreciated. This is my first time hearing of ruby chocolate and I am fascinated!I need to try and get my hands on some as that color is just divine! Thank you so much for sharing all of the detail! I love the color so a bit disappointed to know it doesn’t keep the same shade when cooked. Interesting! I had heard about this “fourth” kind of chocolate but had no idea where to find it. Reading your review, I don’t think I’d like it. Hi Gaby, I think (well it is the approach I am taking) you just need to not think of it as traditional chocolate. It’s unique and interesting. Do try it if you get the chance to .